My wife and I enjoyed seeing Henry V at the Shakespeare Tavern Playhouse in Atlanta this evening. I was amused to see so many women actors on stage playing male parts, as though the director was saying, well, in Elizabethan times men played women, so now we’re going to reverse it. Arms of Henry IV from 1406, arms of Henry V. Wikipedia. 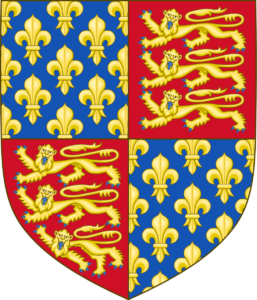 Edward III, back in 1340, was the first English king to quarter the arms of France with the arms of England, by means of illustrating his claim to the throne of France. At the time France was represented by Azure, semé de lys Or – that is, a blue field strewn with an indeterminate number of fleur de lys – “France Ancient” in the lingo. Arms of Edward III from 1340, arms of Richard II, arms of Henry IV to 1406. Wikipedia. 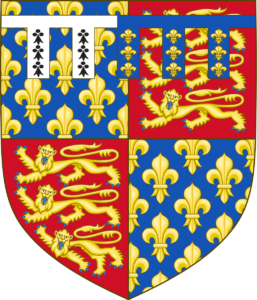 In 1376, King Charles V of France reduced the number of fleur de lys in the French royal arms to three (“France Modern”) and King Henry IV of England followed suit with own his coat of arms in 1406 or so. Henry V inherited this coat of arms, along with the throne, in 1413. So where does the coat of arms France Ancient quartering England with a label of five points per pale Ermine and France come from? Apparently it was borne by Henry V’s father Henry IV, before he became king, for a brief period in 1399, when he was both Duke of Hereford and Duke of Lancaster. The label was reused by Henry V’s brother John, Duke of Bedford, who served as his regent for France, but the first and fourth quarters of his coat of arms were France Modern, not France Ancient. Arms of John, Duke of Bedford (d. 1435). Wikipedia. I realize that few people care about heraldry as I do – and that critiquing an entire production of a Shakespearean play based on a single anachronism is pedantic and philistine! But I still think that with a little extra effort, you can get such details right. The Shakespeare Tavern is proud to claim that it’s an Original Practice playhouse; I can assure you that Shakespeare’s audience would have noticed this. Or was it intentional? This is always the question when faced with apparently problematic details. 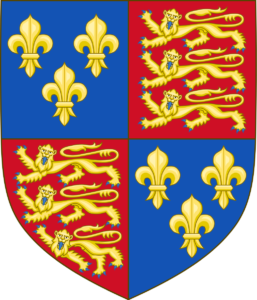 Richard II had exiled the future Henry IV in 1397, and upon the death of Henry’s father John of Gaunt in 1399, seized the Duchy of Lancaster. Henry’s return to England reclaim his rightful inheritance gathered so much support that it turned into a revolution, deposing Richard and installing Henry as king. By using the arms of his father “coming to reclaim his inheritance,” is the play suggesting that Henry V’s French expedition is somehow parallel to the Lancastrian Revolution – that Henry V is attempting to live up to the example of his father, who did the same thing in 1399? Perhaps. Personally I don’t like having to make the “fanboy save,” as I heard it described once. • According to a drama major in one of my classes, a theater (-er) is a place, while theatre (-re) describes the acting profession. And here I thought it was just a British variant spelling still acceptable in the US. • “Thespian” to describe an actor derives from Thespis of Icaria; “Thespian” as a demonym describes someone from Thespiae in Boeotia. These Thespians were with the Spartans at Thermopylae (not that the movie 300 shows them).